I am an Ofsted Regeistered Childminder. I live with my husband in Merstham,Redhill. We have a lovely lurcher called spider who is obviously good with children. I have three children that are now grown up with families of their own. I like to take the children out every day and make the most of being outside in the best learning environment! Also I enjoy cooking and healthy eating and involve the children as much as possible at meal times. 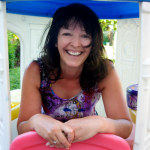 I have been a Network Childminder for 12 years. On occasions I have done temping work in Nurseries for Reed Education both as room Leader and Nursery nurse. I have also worked with special needs children. In addition I have attended over 24 workshops on childcare. This has provided me with information and knowledge on matters such as behaviour management, infection control, home safety, living with asthma and eczema to name just a few. I regularly attend courses and update my knowledge in line with current changes, such as the EYFS (Early Years Foundation Stage). I do provided for the early years free entitlement.